Have you ever heard someone talk about a “Needle’s Eye Gate” in the Jerusalem wall? That’s a myth. 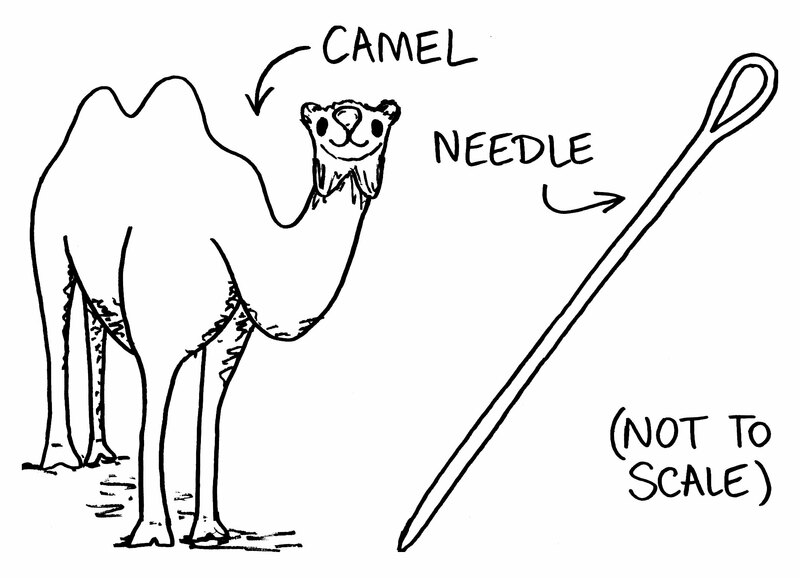 Both “camel” and “eye of a needle” mean just what you would expect them to mean. The story of the rich man and Jesus is told in Mark, Matthew, and Luke. Each telling has its own distinctives. The most significant thing Mark has that the others don’t is the part about Jesus loving the man. I have heard sermons impugning the man’s character, arguing that he was full of pride for claiming to have kept the Ten Commandments. But that is a misreading of the story, as Mark makes clear. Jesus does not dispute the man’s claim to have kept the law, instead he loved the man for his sincerity and earnestness. But something was in the way. Despite his sincerity, morality, and genuine desire to learn from Jesus, he is not able to put aside his wealth. In fact, he is shocked (more literal than “face fell”) that Jesus asked such a thing. How could Jesus know his one hangup? Two things we can learn here: 1. despite our best intentions and sincere desire to follow Jesus, sometimes things get in our way, preventing us from becoming his disciple; 2. Jesus will zero right in on whatever that is and tell us to get rid of it. The Holy Spirit will help us get rid of it, but it will still be hard. (Whoever said this discipleship thing was easy? No one who has tried it.) It won’t always be wealth (though all U.S. citizens reading this need to recognize how incredibly wealthy we are by the world’s standards. It’s kind of obscene really), but it will always be required of us. If you’re like me, there will be more than one of these things and Jesus will let you give them up in stages, as you’re ready for it. But make no mistake. The choice to give it up or keep it is a real one, a deal breaker. The rich man leaves because he can’t be Jesus’ disciple without divesting himself of his wealth. When Jesus tells you to get rid of something (and I promise he will) your choice is a stark one: let it go and follow Jesus or go back home.